I do not know my multiplication tables. But I know how to multiply. I learned the tables as a kid but I don’t use multiplication in my everyday life. When I multiply some of its by memory, sometimes I mentally figure it out, or sometimes I use a calculator. I know how to do math and so does Adeline. Because most people are most familiar with the public school model they assume she can’t possibly be learning because she doesn’t know her multiplication tables. 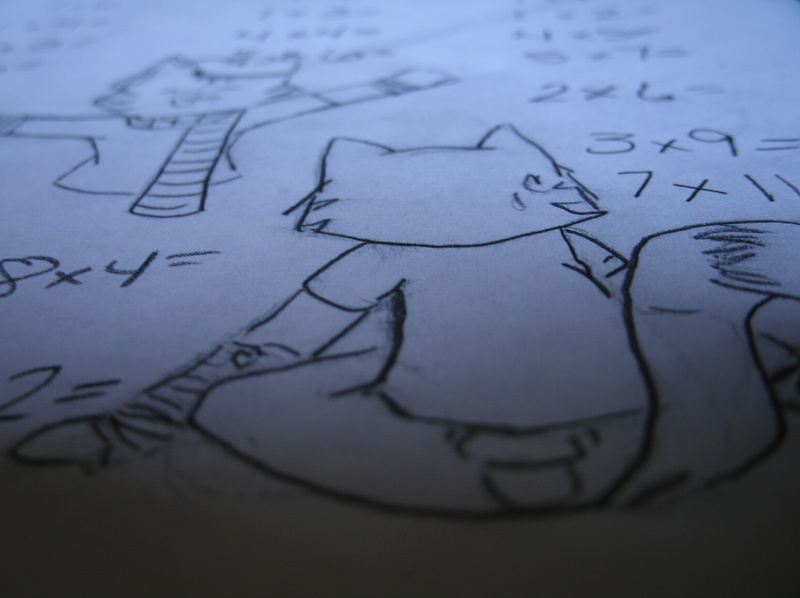 Inside and outside the unschooling circles the question inevitably comes up- “What about the multiplication tables?” Just what is so important about this group of numbers that is so necessary to memorize? I’d be happy to never have to deal with them. But I’m in a unique situation with my oldest daughter. She keeps getting asked by well-meaning but misguided adults about them and it frustrates her to not be able to make them proud. I think eventually they’ll catch on to the whole unschooling philosophy and won’t take pride in anything but Adeline in and of herself. Even if they don’t, she’s learning that she doesn’t have to impress anyone with her knowledge because she’s steadily gaining confidence in herself and how and what she learns. However, for awhile I’d promised to help her memorize them. But she doesn’t have a real desire to learn so she gets annoyed when I remind her to write a few sets. Then she gets frustrated because she’s bored. I’ve explained to her its no big deal because its just memorization-like a poem only less rhythmic-and to some number junkies out there it may actually be considered the most beautiful poetry in existence. She’s memorized her parts for plays. But she won’t be standing in front of an adoring audience reciting multiplication tables and waiting for a round of applause. Sure those adult who ask her what 4 x 7 will smile and tell her good job when she gets the answer correct but its not the same kind of satisfaction. you’re such an incredible human being! sending you love via computer waves. keep it up awesome momma! xoxoxo to you and yours. ps: I LOVE pippi longstocking!! Manning use to cry when she would do math workbooks. They just didn’t make sense to her, and so she too thought math was boring and hard. Then we found “Math with Fred”, which is a story about the life of Fred and the math in his everyday life. She immediately related to this book and now, for the most part, she understands the math she is learning. The book has a fun sense of humor so Manning finds that entertaining as well. Nothing better than fun learning! It’s “book” learning she doesn’t mind doing on her own and then later she’ll come ask questions if she has any. Mandalas are a fun way to see math (sacred geometry) in art. Not that you’re looking for ideas or suggestions….just sharing what we’ve enjoyed. When I’m happy or excited to learn something two things that matter to me…relevance to my life and a deep appreciation for the wonder of it. This is one reason I like homeschooling, because I can allow Manning to learn what is relevant to her life. And as a homeschool mom you know, those are the things they really relish. Cool to know someone who uses that. I’ve had it in my Amazon wish list for awhile with plans to get it when she was older. Maybe I’ll revisit them-thanks for the reminder.